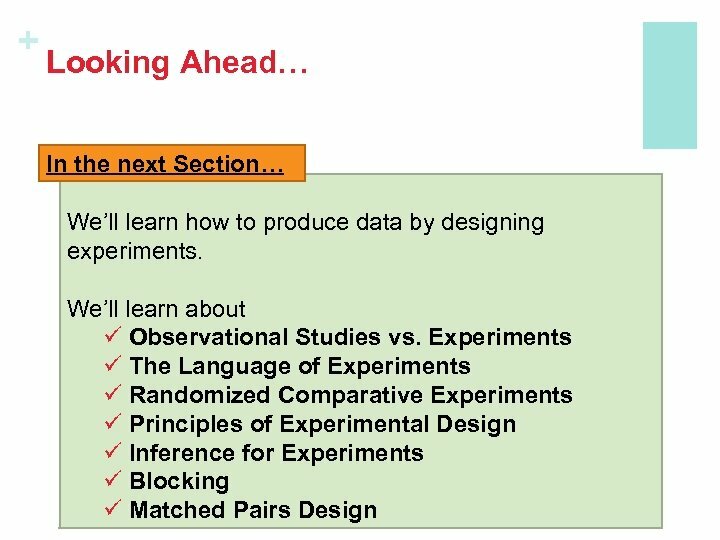 and Sample + n Population Definition: The population in a statistical study is the entire group of individuals about which we want information. A sample is the part of the population from which we actually collect information. 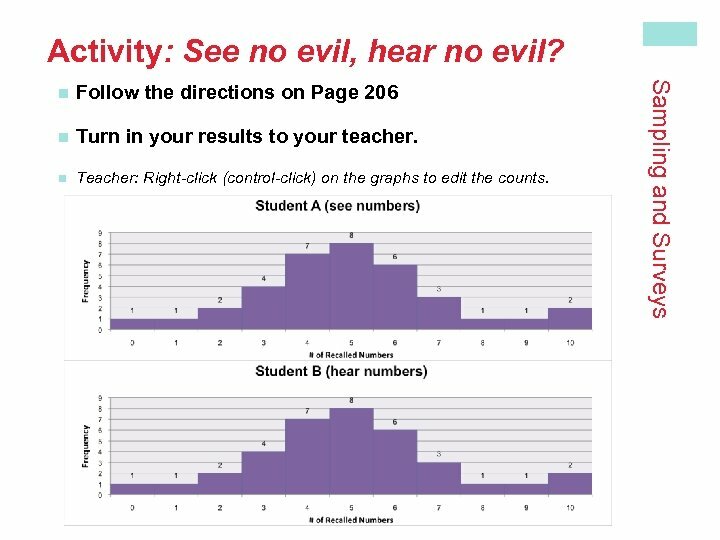 We use information from a sample to draw conclusions about the entire population. 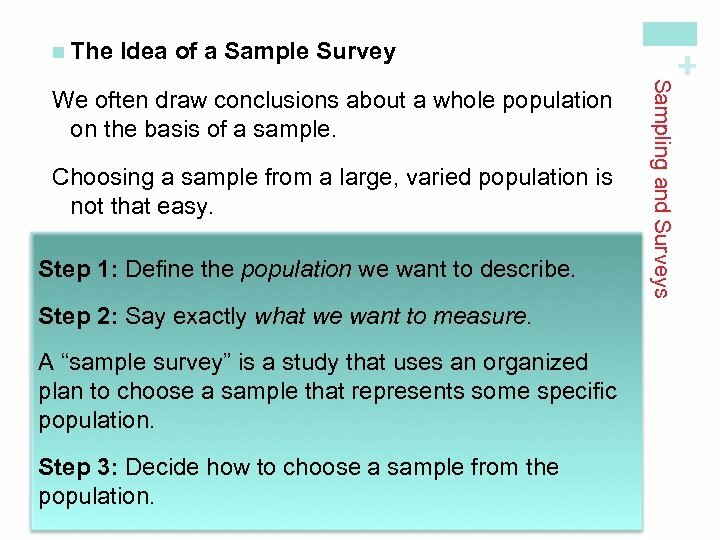 Population Sampling and Surveys The distinction between population and sample is basic to statistics. 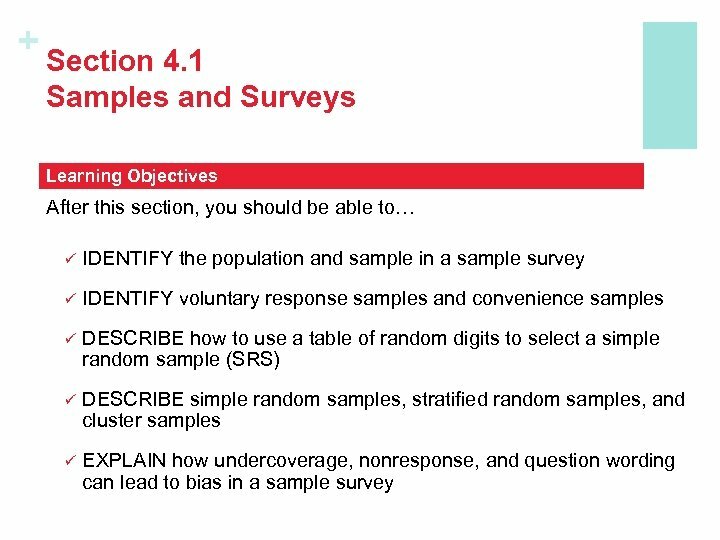 To make sense of any sample result, you must know what population the sample represents Collect data from a representative Sample. . . 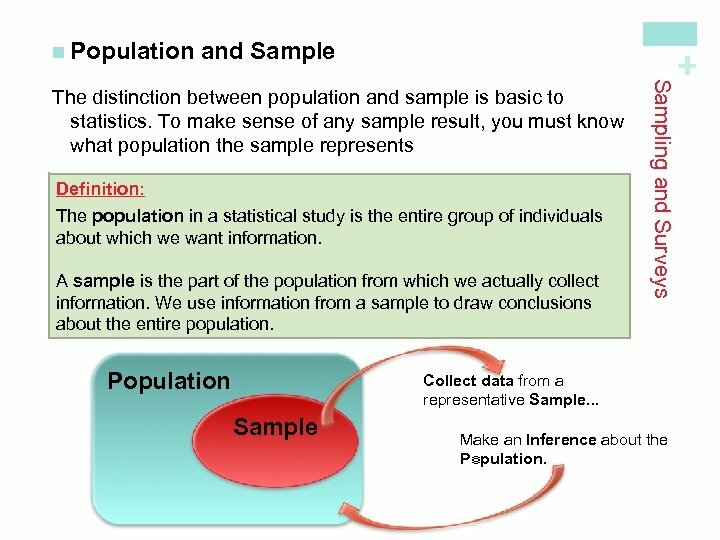 Sample Make an Inference about the Population. 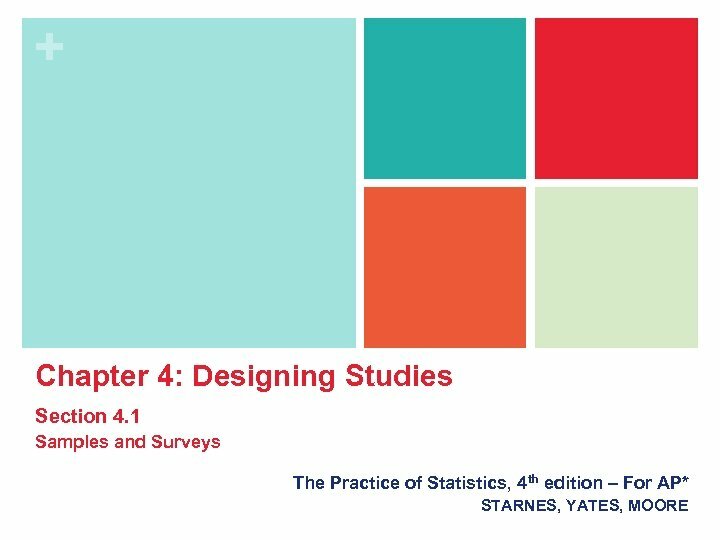 to Choose an SRS Sampling and Surveys Definition: A table of random digits is a long string of the digits 0, 1, 2, 3, 4, 5, 6, 7, 8, 9 with these properties: • Each entry in the table is equally likely to be any of the 10 digits 0 - 9. • The entries are independent of each other. That is, knowledge of one part of the table gives no information about any other part. 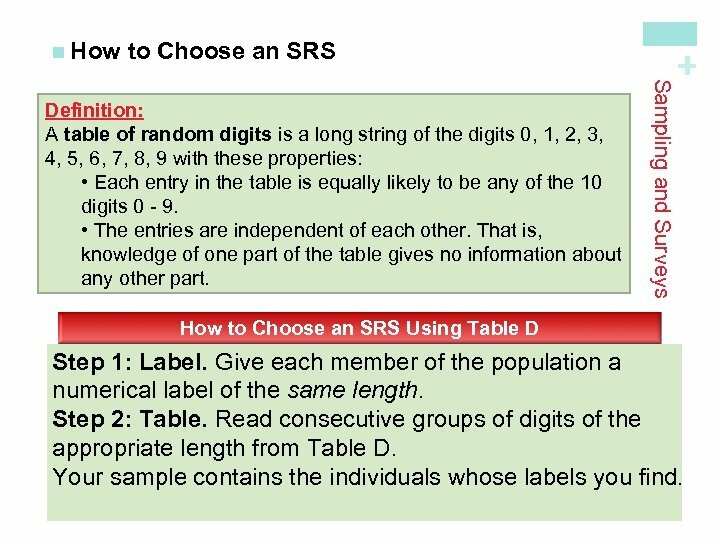 + n How to Choose an SRS Using Table D Step 1: Label. Give each member of the population a numerical label of the same length. Step 2: Table. 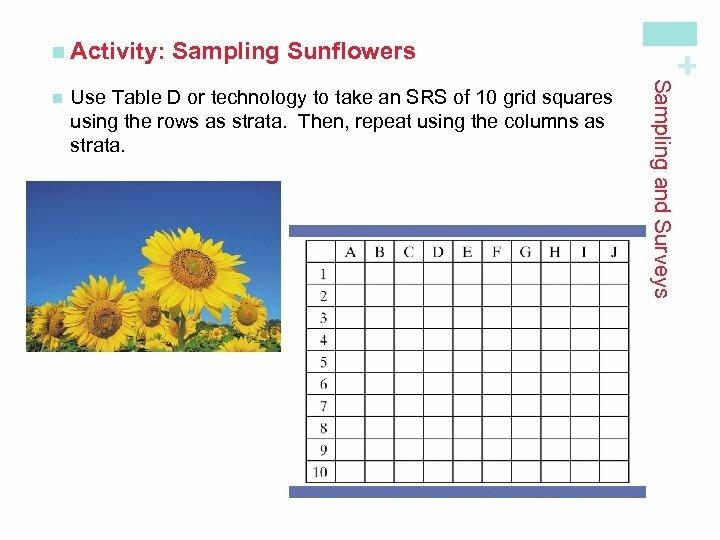 Read consecutive groups of digits of the appropriate length from Table D. Your sample contains the individuals whose labels you find. 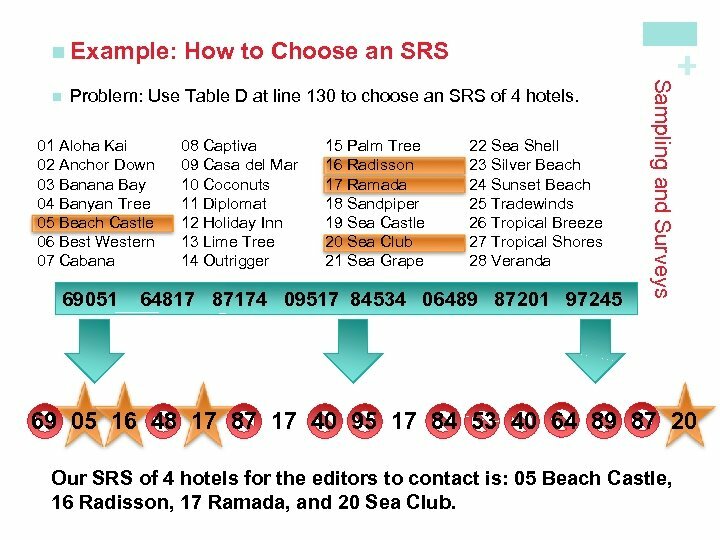 Problem: Use Table D at line 130 to choose an SRS of 4 hotels. 01 Aloha Kai 02 Anchor Down 03 Banana Bay 04 Banyan Tree 05 Beach Castle 06 Best Western 07 Cabana 69051 08 Captiva 09 Casa del Mar 10 Coconuts 11 Diplomat 12 Holiday Inn 13 Lime Tree 14 Outrigger 15 Palm Tree 16 Radisson 17 Ramada 18 Sandpiper 19 Sea Castle 20 Sea Club 21 Sea Grape 22 Sea Shell 23 Silver Beach 24 Sunset Beach 25 Tradewinds 26 Tropical Breeze 27 Tropical Shores 28 Veranda 64817 87174 09517 84534 06489 87201 97245 Sampling and Surveys n How to Choose an SRS + n Example: 69 05 16 48 17 87 17 40 95 17 84 53 40 64 89 87 20 Our SRS of 4 hotels for the editors to contact is: 05 Beach Castle, 16 Radisson, 17 Ramada, and 20 Sea Club. + Section 4. 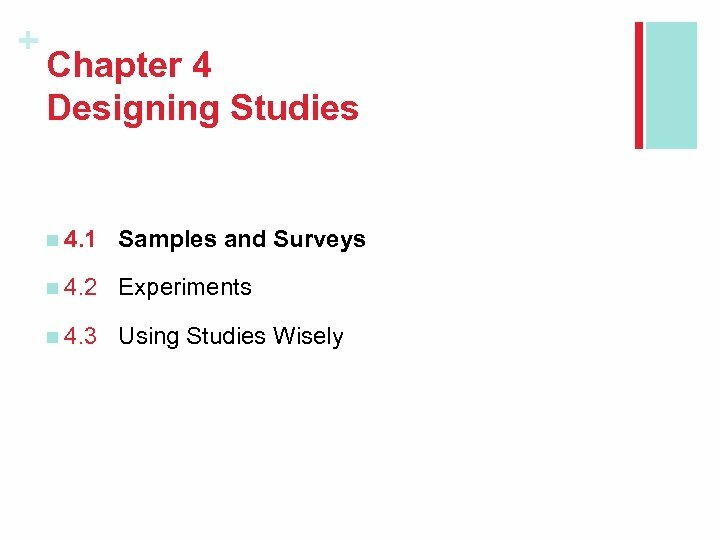 1 Samples and Surveys Summary In this section, we learned that… ü A sample survey selects a sample from the population of all individuals about which we desire information. 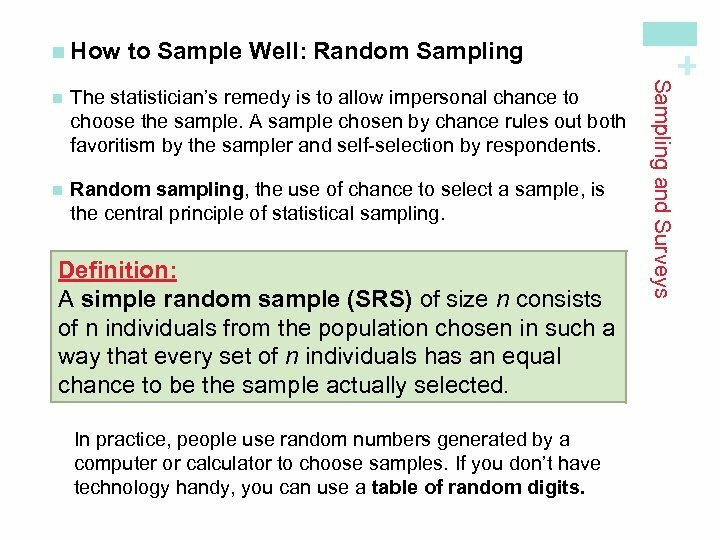 ü Random sampling uses chance to select a sample. 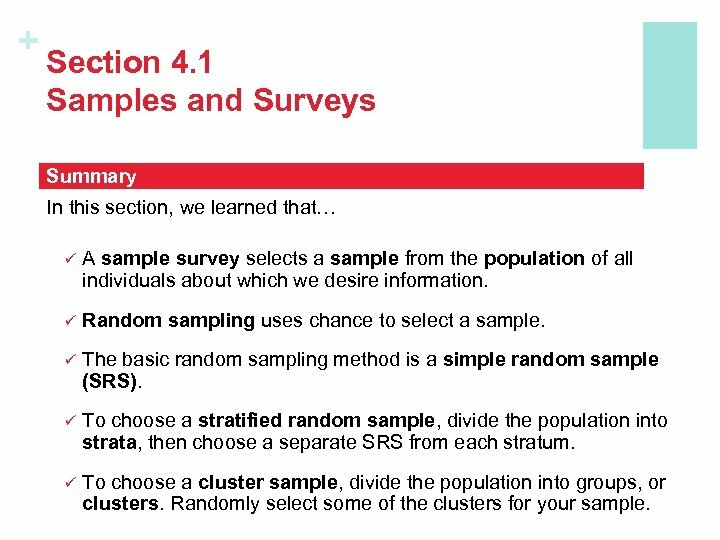 ü The basic random sampling method is a simple random sample (SRS). 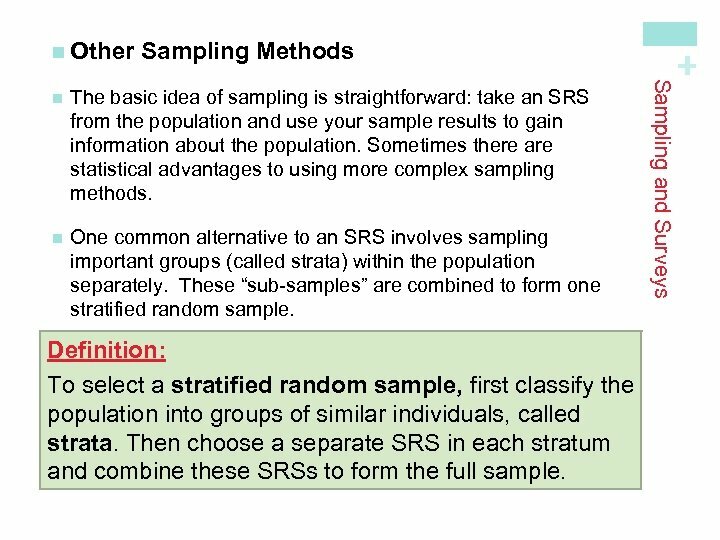 ü To choose a stratified random sample, divide the population into strata, then choose a separate SRS from each stratum. 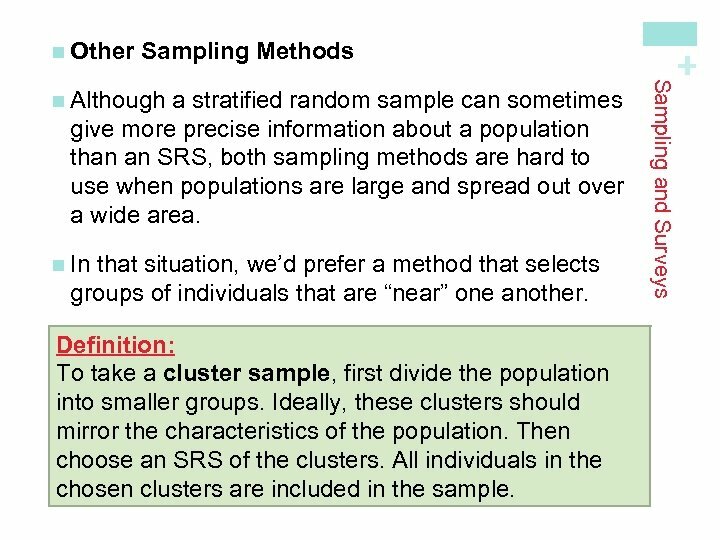 ü To choose a cluster sample, divide the population into groups, or clusters. 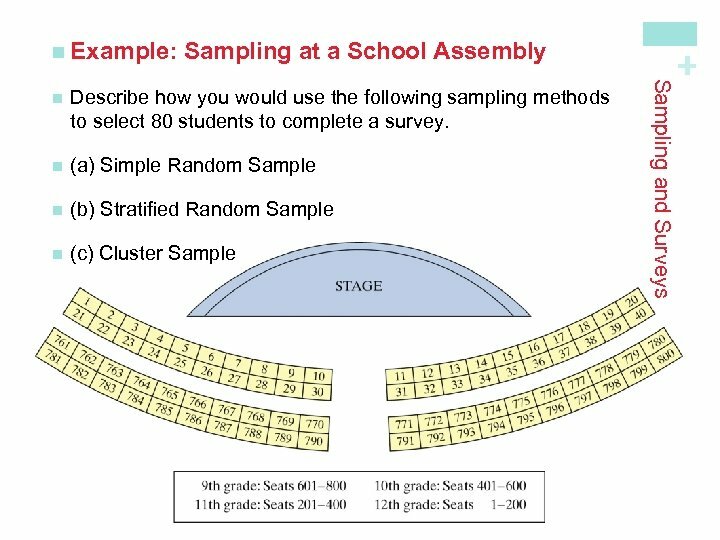 Randomly select some of the clusters for your sample. + Section 4. 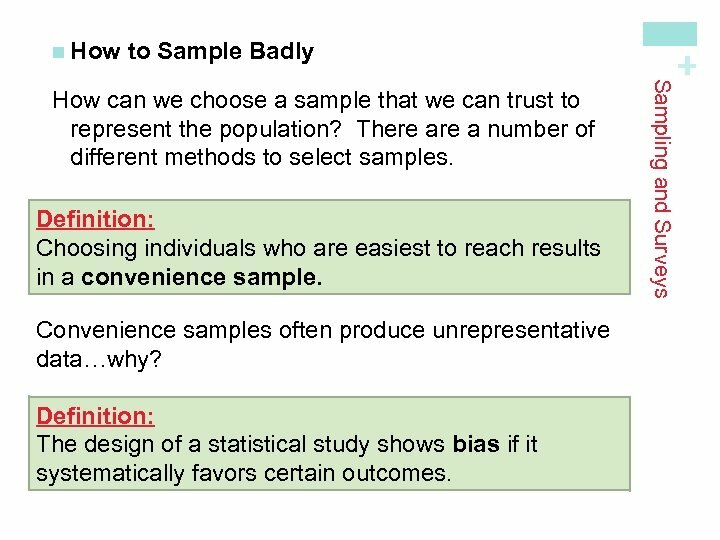 1 Samples and Surveys Summary, con’t In this section, we learned that… ü Failure to use random sampling often results in bias, or systematic errors in the way the sample represents the population. 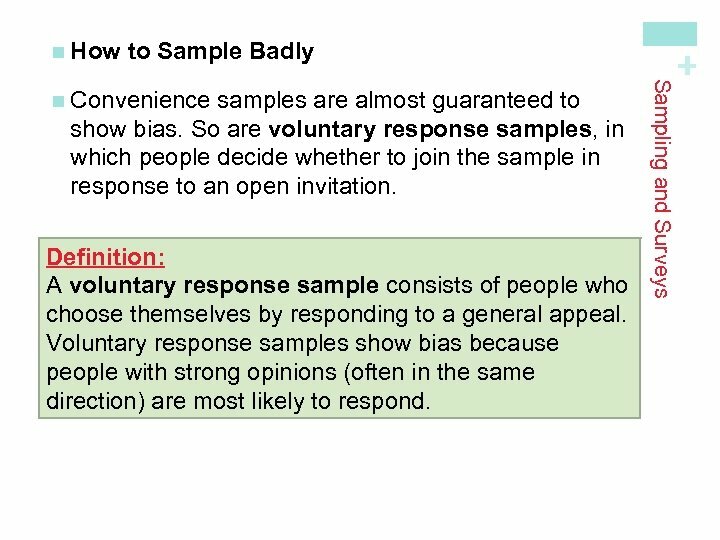 ü Voluntary response samples and convenience samples are particularly prone to large bias. 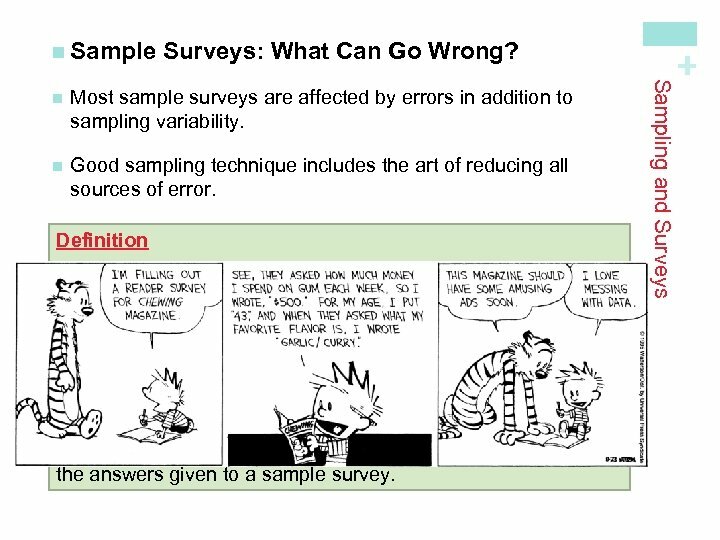 ü Sampling errors come from the act of choosing a sample. 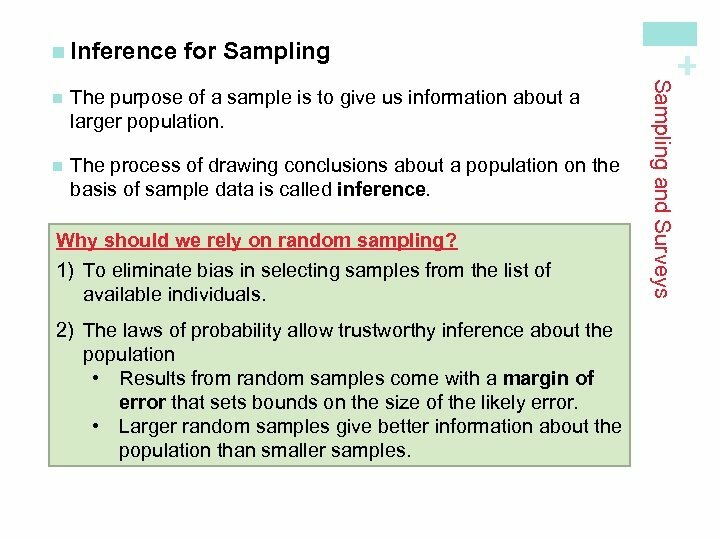 Random sampling error and undercoverage are common types of error. ü The most serious errors are nonsampling errors. 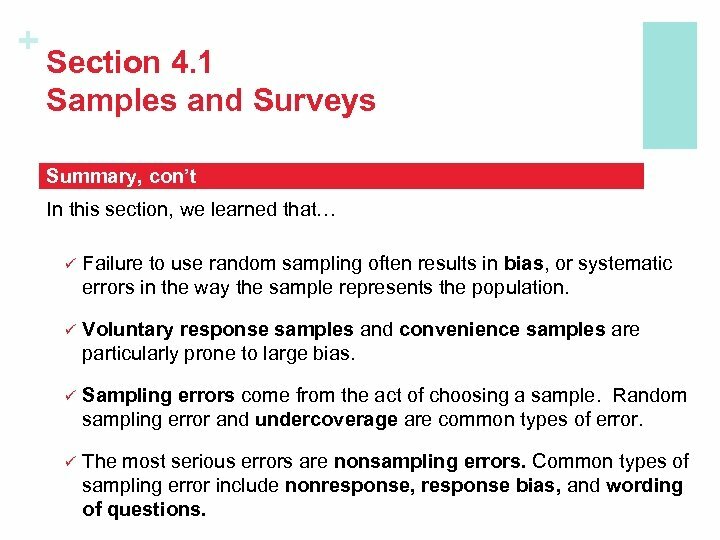 Common types of sampling error include nonresponse, response bias, and wording of questions.